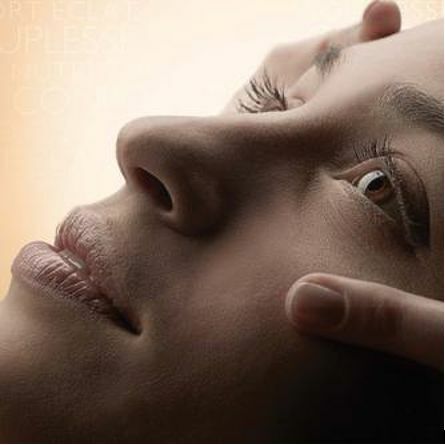 treatments impart a refreshed appearance that makes skin look and feel revitalised. skin from the redness and discomfort caused by external aggressors like cold wind. collagen mask to infuse and draw moisture into the skin. A complete anti-ageing treatment to fight against the signs of ageing. A triple action ritual to combat skin ageing. Simultaneously treats wrinkles, slackening of the skin, lack of comfort and loss of radiance. The perfect combination of absolute relaxation and beauty. Pure White reduces the production of melanin to limit pigmentary spots, reduces free radicals that age the skin and eliminates dead skin cells to give a “radiance blast”. Treatment that restores energy to the skin. A unique treatment of relaxation and energy thanks to the properties of the super fruits. Perfect for dull and tired skin. Textures, fragrances, gestures... all the senses are awakened to live a moment of pure well-being. Facial massage by digital pressure, face and scalp massage, so much care for a relaxing and full anti dark spot program. A unique treatment that instantly and visibly fixes the loss of firmness and elasticity, restores the volume and lifts the face and neck contours. Once applied, the active ingredients are delivered through specially developed passive gymnastic hand movements to firm the skin and provide an immediate tightening effect. The treatment intensely hydrates even the thirstiest skin. It provides the benefits of deeply hydrating, moisture-rich active ingredients, such as softening cornflower and hyaluronic acid.